This was dinner tonight. It was amazing. There is no pasta in this but instead 9 layers of grilled eggplant, cheese and Italian sausage. I grilled the eggplant on the outdoor grill until they were nicely browned. That made for a slightly smoky flavor that was like icing on a 9 layer cake. We all loved it. My five year old asked me if I could make it “all the time.” It was a bit time consuming although not in the least bit difficult. It is well worth the time! By the way I have to tell you that this picture doesn’t do it justice. Allow cheeses to come to room temperature. Combine both cheeses and eggs in bowl and beat until smooth. Season with salt and pepper. Heat coconut oil in saute pan. Remove italian sausages from their casings and break up into small bits. Fry until brown. Remove sausage from pan and set aside. In pan with the excess fat toss in spinach. Cook down until spinach is fairly well-cooked and juices have released. Heat out-door grill to medium high. Slice eggplant to about a 1/4 inch rounds. Drizzle with olive oil and sprinkle with salt. Grill on both sides until cooked through but not limp/soft and browned. I did this on the outdoor BBQ because it is quick and there is no clean up. The goal here was to cook the eggplant so that it dries up a bit and you don’t end up with a wet or runny lasagna. You could do this indoor on a grill pan too. 1~Assemble in the bottom of a 9 x 13 x 3 spread about half of the marinara sauce. 2~Over that use half of your eggplant in an even layer. 3~Then cover with about half the mozzarella cheese. 4~Now add all the sausage and spread over evenly. 6~Cover with the ricotta mixture. 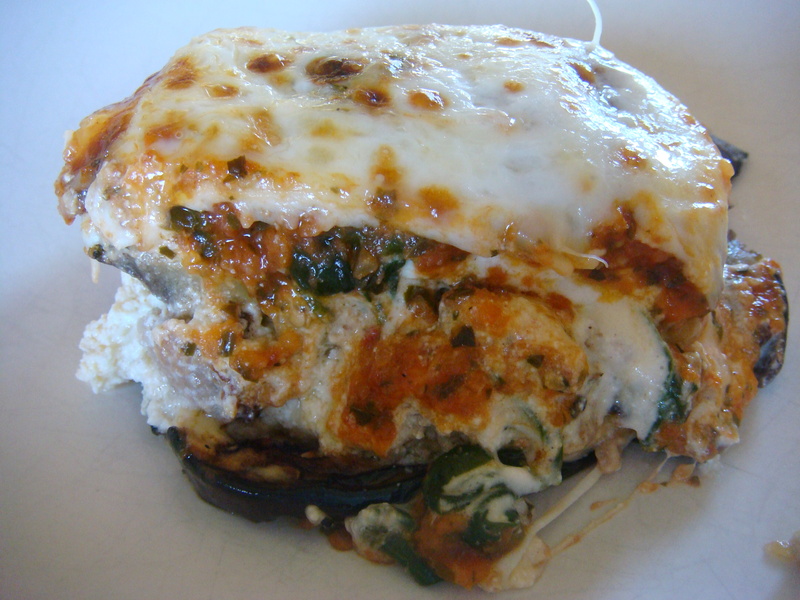 8~With remaining marinara, cover the ricotta/spinach layer. 9~Finally, top with remaining layer of mozzarella. Cover with foil and bake at 350 for about an hour or until center is hot and set. Remove foil and let cheese on top brown. Remove from oven and let cool and set for 15 – 20 minutes. If you cut into it right away it won’t maintain it’s shape. This recipe will be perfect for my husband… My kids and I love lasagna but my husband’s not really into carbs lately since he’s trying to loose a lot of weight as per doctor’s advice. So, this lasagna recipes of yours will be something he can dig in with his kids once in a week may be. Thanks! I hope you all like it as much as we did. I am going to make it again soon.